SINCE it bursts onto the scene just over a year ago, Eco World Development Group Bhd has created a strong brand and achieved impressive sales under the leadership of group president and CEO, Datuk Chang Khim Wah. “Our first launch, EcoBotanic in Nusajaya, Johor, was on Sept 22 last year … we’re a little more than a year old,” says Chang. Eco World is one of two recipients of The Edge Malaysia Notable Achievement Award 2014. Recipients are selected based on significant recent achievements that have raised their profile as a leading Malaysian developer. In August, Eco World announced that it has exceeded its sales target of RM2 billion for its financial year ending Oct 31, 2014. As at July 31, it had generated sales of RM2.015 billion. The developer has an ambitious sales target of RM5 billion in two years, with RM3 billion projected for 2015 to add to the RM2 billion of 2014. Aside from EcoBotanic, the other projects are EcoSky in Jalan Ipoh, EcoMajestic in Semenyih, and EcoSpring, EcoSummer and Eco Business Park 1 in Johor. The projects have an estimated combined gross development value (GDV) of more than RM25 billion. Eco World also has an ongoing project in Iskandar Malaysia - Kota Masai township, which has 991.6-acre of remaining landbank. The developer recently revisde the masterplan to create two separate developments - EcoTropics township and Eco Business Park III. While Eco World is a new property player, the senior team leading the company comprises old hands in the business; the same team that made S P Setia Bhd one of the biggest property developers in Malaysia. The team crossed over to Eco World in stages following Permodalan Nasional Bhd’s takeover of S P Setia in 2012. Aside from Chang, its key management team includes former S P Setia president and CEO, Tan Sri Liew Kee Sin; Datuk Teow Leong Seng; Datuk Leong Kok Wah; Datuk S Rajoo; Liew’s son, Liew Tian Xiong; and Heah Kok Boon. Since the end of the previous financial year, Eco World has entered into several major acquisitions. This will increase its landbank from 991 acres to approximately 4,926 acres and grow its GDV to RM47 billion. Some have attributed Eco World’s success to the strong confidence in the track record and reputation of the team, allowing Eco World to create a strong brand in a short time. Chang does not deny that the team’s track record and reputation have played a role in Eco World’s success. However, this has also led people to question if Eco World will replicate what they did in their previous company. “In the beginning, at every media interview, we were asked whether we were going to repeat [ourselves]. While we have used the foundation we built, we’ve made it a point to create something different and a new experience for our customers. “I believe what we have done looks and feels new and fresh from those of other developers. We can’t say that we give the best service or product but we have really gone all out, right down to the last detail, so that buyers feel special when they buy from us, and see the difference in what we offer. Our efforts have paid off; you feel this difference when you visit our sales gallery. So, we encourage everyone to come to our sales gallery,” says Chang with a laugh. The Eco World brand stands on solid footing, which Chang is pleased about. “It’s a new brand that’s growing very fast as everyone knows we have the advantage of an experienced team. I think Eco World is definitely a brand in its own right now. “No doubt people will still compare us with other developers [and their products] but developments are mostly the same; it’s a matter of whether buyers feel excited and want to own a product or find out more about it. Curiosity aroused, curiosity satisfied,” he explains. “Again, it comes down to the ability to create something new and different. I think those questions are answered by our sales figures,” adds Chang. However, he acknowledges areas for improvement. “We don’t have the [market] reach yet. It’s just the beginning for us. We have new team members joining us, so we will have new ideas and improvement of old ones,” says Chang. Eco World has emphasised product quality from the very beginning, which Chang believes can differentiate the company. This is more than just ensuring the roofs don’t leak or the wall plastering is smooth. “There are two layers to product quality. One is the minimising of defects, and the other is more holistic. We look at things like whether space usage is efficient, practical and suits lifestyles today. Are the doors in the right place? Does the bathroom design make sense? Are the walkways connected throughout the entire development so that the residents can walk, cycle and jog safely? “We have gone into detail for every aspect of quality. We believe that is what makes us different. We have master plans for everything; walkways, security and so forth,” says Chang. A unique aspect of Eco World is that all its landed developments will be strata-titled regardless of location. “EcoMajestic is all landed strata, I don’t think many developers dare to do over 1,000 acres of landed strata in Iskandar. We made a decision to have strata titles for all our landed developments because we believe strongly in building community. It means residents have power over their community and in the future, can control the collection of fees and the quality of maintenance. This way they can integrate better and see the value of the property,” says Chang. With Eco World completing what Chang calls “the first phase of its growth”, the developer is looking to expand internationally as well as locally. “We are already in different property segments and will expand, whether to mass housing or high-end. Liew and Teow are reviewing potential international projects. We have been given a lot of offers,” says Chang. Teow was the chief financial officer in S P Setia. 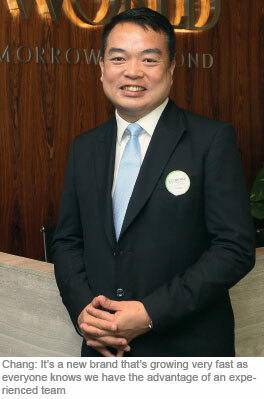 He is currently CEO, International Business in Eco World. “Now that we are in the second phase of our growth, we have the pleasure of constructing what we have sold. Improvements are being put in place so that when the product is handed over, these will make a difference — from the quality of service and products to the company’s growth,” says Chang. Eco World will build its revenue and profit stream from the sales it has made, while sourcing for landbank in good locations. There is also the recently launched Eco World Foundation, which serves as the developer’s corporate social responsibility platform. The foundation will focus on education, which will be channelled through its Eco World Student Aid Programme, to provide financial assistance to 3,000 underprivileged students. “We will start fundraising in October. The foundation is a very important part of our structure as we must be able to give back to society. We are very happy to be able to do this so fast. We plan to raise RM4.5 million from our partners, associates and, of course, ourselves. We hope to exceed the target,” says Chang. Meanwhile, Eco World is gearing up to launch the 12.8-acre EcoTerraces in Penang early next year and Phase 4 of the 1,073-acre EcoMajestic by the end of 2014. It is also looking to launch EcoTropics in Iskandar and EcoBusiness Park III in Iskandar by year-end. The EcoMajestic show village will be ready by December, while the EcoTerraces sales gallery should be ready by March or April next year. “So there will be quite a few milestones in the coming six to nine months,” says Chang. As for the current market slowdown, Chang hopes for no more regulatory changes, and thinks that the measures to cool the market, “especially the investment part of it”, currently suffice. “In the long term, it will be good for the market, which I think is finding its balance at the moment,” he adds. Eco World has seen many retail as well as investment buying of its products. “If there are not many jolts to the global and Malaysian economies, we think the market will be fine,” says Chang. This article first appeared in City & Country, The Edge Malaysia Weekly, on October 20 - 26, 2014.